We started looking for a kitchen table ever since we signed the lease on our new apartment. I really wanted a multi-purpose space for us. 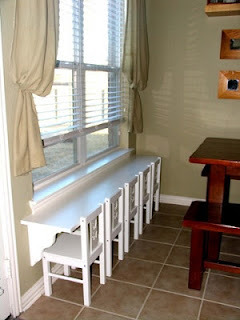 Our last apartment was very small, so I had originally looked at those small, two person, pub/cafe tables. I just never got around to purchasing one and I am kind of glad I didn't. Our new apartment has much more room for a table. However, we quickly filled up the living/dining area with living room and office furniture. I thought about moving my desk and office stuff to the guest room. The guest room is a no go now, since we ended up with a full-sized bed (in case our guests are a couple) and the fiancé and step-son protested when I suggested getting rid of the couch in the guest room. My apartment kitchen has this strange awkward space. It is too small for a kitchen table width wise, but is extremely long (96"). I have this kitchen cart that I picked up one day for $20 from a friend who I'm sure either picked it up from Craig's List or Ikea. 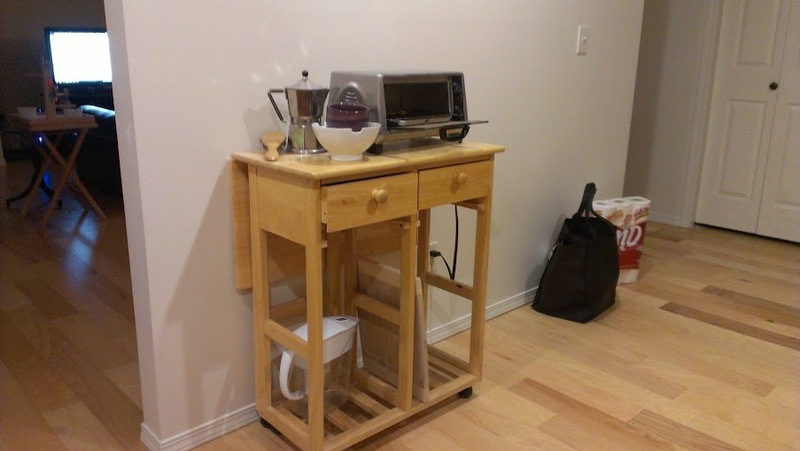 It fit my space in the old apartment, which had a tiny kitchen and desperately needed more counter top. It is now swimming in my current kitchen! I have this awkward space in my kitchen. My old kitchen cart, which was perfect for my old, smaller apartment, is now swimming in this space! It is also the perfect space to accumulate garbage, groceries, etc, because you can maneuver around anything that accumulates here. 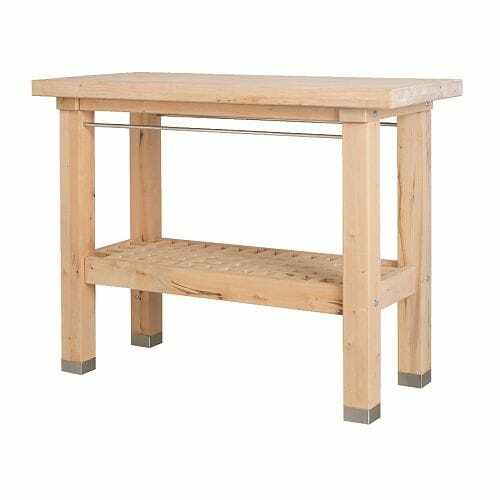 GROLAND - Kitchen island in birch from Ikea for $199 Width: 47 1/4", Depth: 20 7/8", Height: 35 3/8". However, the dimensions aren't quite right. My wall is 96" wide, so I would have over two feet on either side with it centered on the wall. I am also not willing to drop $200 on a piece that wasn't just right. 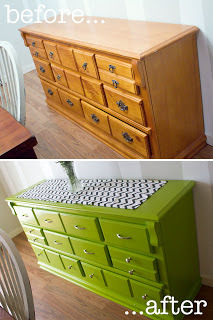 I have also thought it would be nice to get an old buffet from Goodwill and fix it up. Re-finish a goodwill find! I LOVE this shade of green. 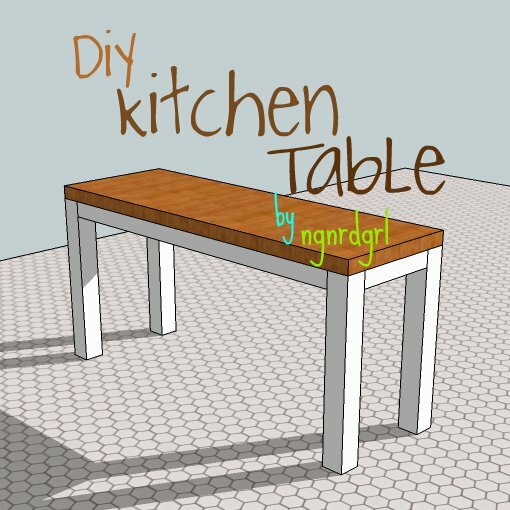 I really wanted something that could serve double duty as additional counter space for a microwave and toaster oven, but also give some table space for eating, doing homework (the fiancé is currently in school) or space for me to make jewelry. I also envision my step-son eating his cereal, drawing or hanging out in the kitchen while I'm cooking. I started thinking about building a bar with a two foot wide shelf similar to the ones below with maybe a one foot shelf above for extra kitchen storage (most likely ornamental in nature). The jewelry working would need a sturdy surface for hammering and I would want it wide enough to be comfortable for an adult. I started thinking of adding legs to a shelf, but this quickly morphed into just building a full table. 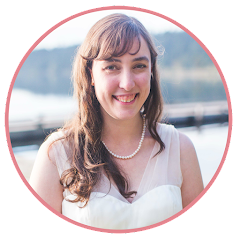 I have loved Ana White's blog from the first moment I stumbled upon it in a comment on someones Facebook. Ever since then, I have wanted to make my own furniture. I thought it would have to wait until I have a house instead of living in an apartment, but I found that it wasn't so bad working in my parking space in the apartment garage when I hacked my Ikea Rykene bed. Ana White's counter height pub table. I love the planked top with the white legs. She also has a good tutorial on how she made it. It looks really simple. 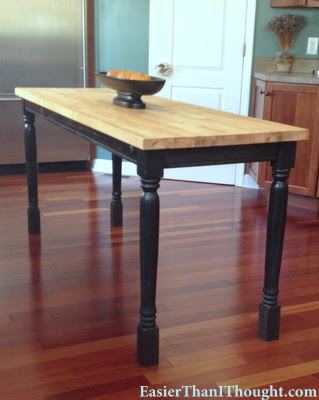 Upcycled dining table turned butcher block counter height table. This is pretty much what I was envisioning! Love having my ideas confirmed as a viable option. I'm really keen on the butcher block top as it eliminates the cracks between the planks. I can just see those cracks gunked up with food and being a bumpy working surface. I want this surface to be multi-purpose: food prep/serving, homework for the fiancé, drawing for the kiddo and jewelry making for me. The dimensions of the NUMERÄR Counter from Ikea seems like the ideal fit. It is 73 1/4" by 25 5/8", which leaves a foot on either end of my wall for maneuverability and seems like the perfect width as well. We moved the kitchen cart away from the wall to mimic the width of what the table might be, just to be sure its the right width and wouldn't make the kitchen too small. This counter is $129 new from Ikea. I have been keeping my eye on Craig's List and have found several butcher block counters being sold there for much less. 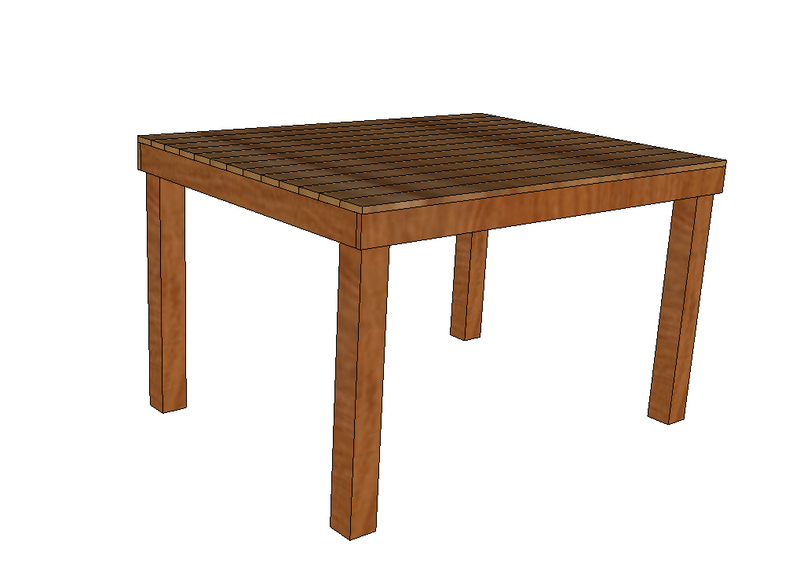 Kitchen Table SketchUp with white legs and apron. I haven't decided yet whether I'm going to paint the legs and apron black or white. I really like how clean the white legs look with the wood top. However, the wall the table will be pushed up next to is also white, so I'm afraid the white will just get lost. What do you think of my kitchen table idea? Black or white legs? Or a dark brown? Or should I do a pop of color (like that green)? 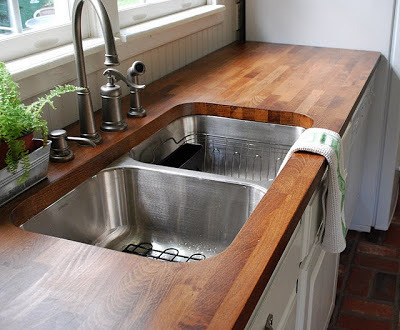 Do you like the planked top or the butcher block better? Have you ever dreamed of making something from Ana White or mimicking a furniture piece by another blogger you admire? What about designing something from scratch? Did you give it a try? How did it turn out? Share with us in the comments below! 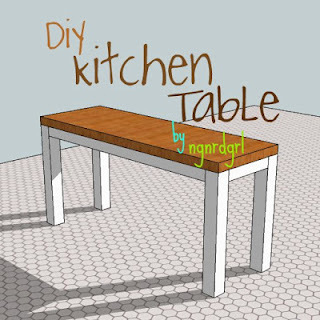 Next up, I'll show you how I make my own kitchen table! Don't forget to follow me so you will be notified when I get this posted. Congratulations! This post is featured over at Diana Rambles today and has been pinned in the Featured at Diana Rambles board at Pinterest. Please grab a featured button off my tabbed sidebar or via the link under the features. Thanks for sharing this awesome idea! This is so awesome! This is my first feature ever! Thank you!!!!! I love that you share your thought process with us - - it's neat to see where it all started! As for your questions, I think you're right about a planked top being awkward to clean-up. The butcher top would be nice and smooth and simple. And after reading the comments above, I'm totally digging the red legs idea. That would be oh so purdy. The 144th Kentucky Derby happens on Saturday, May 5 and, as ever, the Run for the Roses guarantees to be the most thrilling race on the wearing logbook. Breeders Cup 2018 Live Stream The race may just last around two minutes, however the 20 racers are vieing for a lot of $2 million of every a furious occasion that is never without dramatization. Yucatan is currently set to go straight into the Melbourne Cup after proprietor Lloyd Williams and associations hauled him out of the Caulfield Cup on Monday evening after at first showing he would keep running in the Caulfield Cup.